All polymer roofs are designed to be installed with auxiliary casing provided by window manufacturers or other. Install auxiliary casing mentioned above, see detail 1. 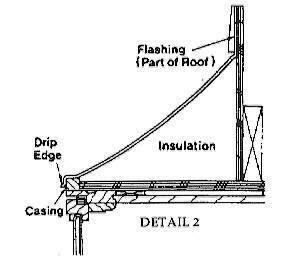 Caulk surface of flashing and other nailing surfaces of roof where it meets building and window. Bay windows are attached to the auxiliary casing with copper screws provided with the roof. 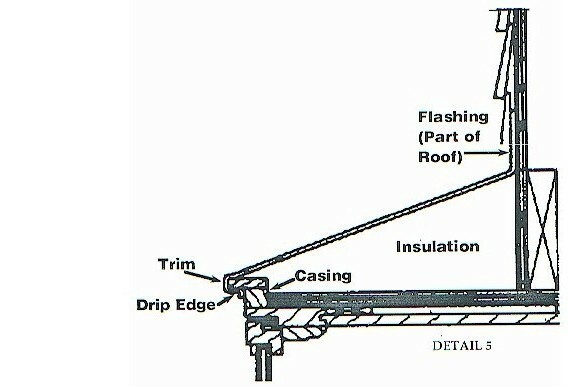 After the roof has been attached to the window, use galvanized roofing nails to attach the roof to the building. It is suggested that you pre-drill the flashing approximately 3/16th of an inch and do not nail tight, leave about 1/16" between nail head and flange for expansion. Install siding - do not nail through flange. No other finishing of the roof is recommended and may void warranty. Care must be taken to insure that windows are installed in accordance with manufacturers instructions including support by cables or knee brackets if required. After installing auxiliary casing, caulk and install trip strips provided with window, see detail 3. Bow windows are attached by locking over the trip strip, see detail 3. Steps 4, 5, 6 & 7 are the same as Bay instructions.